How Easy Is Organic Gardening? Very! Organic gardening is easy to do. I wrote Grow So Easy; Organic Gardening for the Rest of Us for a young woman who wanted to go organic but was sure it was just too hard to do. I also wrote it because I remember being in exactly that same place almost 40 years ago. Organic gardening was hard and organic gardeners were weirdos, people who lived on the fringe of “real” life. But I was intrigued so I decided I needed more information. When I wanted to learn about organic gardening, all those years ago, there was no Internet (hard to believe, right?). I’d never heard of Ruth Stout or Jerome I. Rodale. Euell Gibbons wasn’t touting Grape Nuts, yet and Adele Davis had already been dismissed as a “nutrition nut.” Jim Crockett (Crockett’s Victory Garden on PBS) hadn’t even shown up on television (yes, Virginia, we did have television back then)! So, I had to start my search the old-fashioned way. I got on my bike and went to the library. Using the Reader’s Guide to Periodical Literature (oh god…I am a dinosaur), I searched for magazines to help me get started. There weren’t many — a handful really — but I did find information and people to help pave my path to becoming an organic gardener. Today, it’s a lot easier to find organic gardening resources. Connect to the Internet, search for those terms and you will get more than 4 million links to sites that offer everything from tips to tools. But beware, many of these so-called “resources” just want to sell you something. I think I had it easier (back in the stone age), to find one or two clear voices, crying in the gardening wilderness! 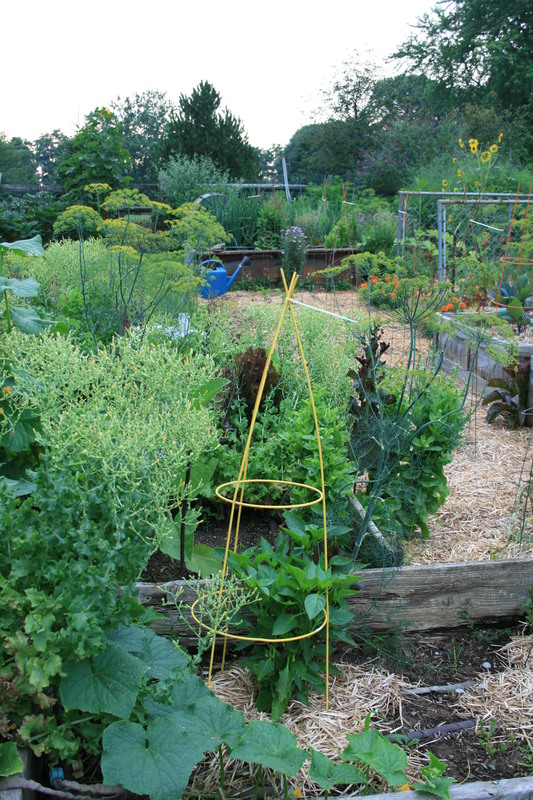 …organic gardening is as easy as you want to make it. It’s all about what you want to grow. Start by figuring out what you want to plant, how many plants you want to put in (based on how large your garden space is) and what works in your planting zone. If you just want to get out there and get started…here are two staples in my garden that are easy to grow and don’t have many bugs that “bug” them. I always have tomatoes – they’re a great vegetable to grow in a pot (if you don’t have enough room to garden or your dirt’s not ready yet) or a plot. If you’re just starting, try to buy compact or “bush” plants. They’re easier to handle and don’t grow nearly as tall as indeterminate varieties like Brandywine or Early Girl. I always plant lettuce, too. A bag of spring greens in my grocery store costs $5.00 for 12 ounces. Fifty two weeks of buying greens comes to just under $300. You can raise enough for you and your significant other for less than $3.00 a year. You can buy seed and follow the directions on the packet to plant it. Or your can buy small starts or plants and toss them in your dirt (in a pot or a plot). All lettuce needs is dirt, water and a little sun. And when it gets a bit too warm for lettuce and it starts to bolt (get tall and taste bitter), if you let it go to seed, you can plant a new crop in the fall for free! One tip from someone whose motto is, “If it’s worth doing, it’s worth overdoing.” Start small and only plant those crops you want. Since it’s already planting season just about everywhere in the United States, I want you to gather up your courage, grab your car keys and head out to a nursery near you to buy your first plants (time enough for seed starting next spring). Dig a hole, water your transplants in and sit back and watch mother nature take over. Need more help? Download my e-book. Free for Prime members and only $2.99….for everyone else. I will post about the tools that would be nice to have on Friday but I could NOT resist sharing this great post about doing battle with cucumber beetles. This group – High Mowing Organic Seeds – is truly organic – no pseudo sprays or powders for them. Just some old-fashioned organic advice on how to fight these little striped demons. Organic Control Measures for Striped Cucumber Beetles | High Mowing Organic Seeds’ Blog – The Seed Hopper. When I wanted to learn about organic gardening, all those years ago, there was no Internet (hard to believe, right?). Start by figuring out what you want to plant, how many plants you want to put in (based on how large your garden space is) and what works in your planting zone (more on this later). I always have tomatoes – they’re a great vegetable to put into a pot (if you don’t have enough room to garden or your dirt’s not ready yet) or a plot. If you’re just starting, try to buy compact or “bush” plants. They’re easier to handle and don’t grow nearly as tall as indeterminate varieties like Brandywine or Early Girl. Dig a hole, water your transplants in and sit back and watch mother nature take over. NEXT FRIDAY: Tools for the practical gardener. They’re “practically” free and are all you really need to begin organic gardening. Just a note: There will be much more information on plant choices, transplanting and plant care as this e-book unfolds but since it’s growing season everywhere, I want to share some simple choices so gardening newbies could get started.